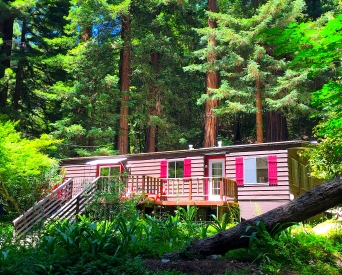 Welcome to your Guerneville woods retreat! Over an acre of land! 2 Lots! Sunny, peaceful, private - and the rare combination of trees and light. A freshly painted interior offers large spaces, comfortably-sized rooms, an updated kitchen with new flooring. There are outdoor areas and a sunny deck for entertaining in style. Dry Sauna, 3 outbuildings, and includes an additional lot providing extra parking and room for the future. Vacation rental?